For a transgender person, there’s no such thing as a simple haircut. A quick trim can quickly turn to open discrimination. While this issue had been covered in a few news stories, it hadn't yet received national attention. So just in time for Pride, Barba Men’s Grooming Boutique launched Strands for Trans, a movement dedicated to creating trans-friendly barbershops and salons. We kicked off our campaign with a stirring digital video that raised awareness. Then, we followed up with firsthand accounts of this discrimination. To show support, Strands For Trans brought people together—trans, gay, straight, everyone—to make a statement with their hair. Barba created a custom look inspired by the colors of the trans flag for people to rock during Pride Month. Even fashion icon Marc Jacobs jumped on board. We celebrated the launch with an in-store event—The Pink, White & Blue Party—donned the windows with posters, made special pink & blue drinks and gave people an excuse to show off their new looks. Introducing a first of its kind registry—an interactive map that shows participating salons and barbershops. Within the first two weeks, Strands for Trans spread to all 50 states. Now, trans people from New York to Alaska will always have a safe space. When shops signed up, they received a barber pole sticker inspired by the trans flag, signaling to the trans community that they are welcome. We set out to help the trans community feel welcome, supported and loved. And ended up sparking a trend that spread further and faster than we ever dreamed. It caught the attention of Allure, Fashionista, Refinery29, among others, proving Strands For Trans isn’t just a moment, it’s a movement. Movember, aka November, is the month when men put away their razors and grow out their facial hair to raise awareness for various men’s health issues, particularly testicular cancer. Barba Men's Grooming Boutique wanted to raise awareness for the movement and for their shop’s new location. 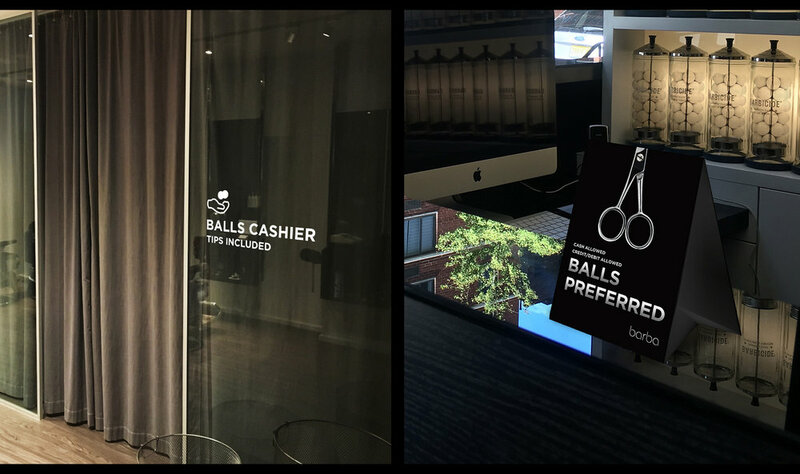 We set up a novel payment system for their customers—letting them pay with their balls. By getting an in-store testicular cancer screening, guys could earn complimentary Movember maintenance. Leading up to Movember, we aroused interest in the event with outdoor posters around the neighborhood and in Barba’s storefront. We then gave the salon a makeover of its own by posting testicular cancer statistics on the mirrors and filling hundreds of jars with subtly suggestive ping-pong balls. Barba’s Facebook and Instagram accounts helped spread the word with posts featuring quotes from real testicular cancer survivors. And to further reward Barba’s potential new customers for taking care of their packages… we created packages of our own. Once the event started, guys lined up around the block to pay with their balls. Not only did they walk away with a free haircut thanks to our in-store cancer screenings, they walked away knowing they were cancer-free as well.